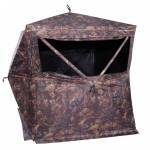 The Brickhouse is an ideal blind for multiple firearm hunters who need extra elbow room and solid shot variety. Versatile window openings feature both shoot-through mesh and gun ports to handle whatever angle or location your shot requires. The Brickhouse is as sturdy and dependable as its name suggests – with a rugged Spider Hub frame that sets up easily and Durashell™ Plus fabric that provides durable protection with a matte finish. Paired with brush loops for adding natural foliage, the Brick.. Durable 600D Polyester SHADOW-FLAUGE Fabric with Blacked-Out Backing 360° Silent Track Window System for Limitless Window Positions Two Sides without Mesh Curtains for Unobstructed View Aluminum Hubs with Engineered Tips and Pins Strong and Flexible Fiberglass Poles Oversized #10 Zippers Durable Mesh Windows Slide for Easy Positioning Two Gear Pockets for Storage Separating Door Design, Makes Blind Take-Down Easier Eight Stakes with Four Tie-Downs Included Durable Shoulder.. 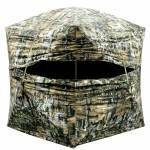 The Mantis 2 Ground Blind features a massive 38 square foot floor space area. 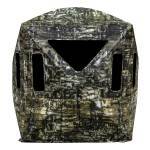 This innovative two-hub blind features and interior slope design to fit a single bowhunter comfortably at full draw. Designed with the archer in mind Up to 50% lighter than traditional hub-style blinds Durable 600 Denier oxford weave poly fabric resists rips and tears Dragnet Window System offers adjustability and concealment never seen before in a ground blind Wicked Intent camo features 14 Earth tones ..
• 5 HUB DESIGN MAXIMIZES STRENGTH • BRUSH LOOPS FOR ADDING NATURAL COVER • SHOOT THROUGH MESH WINDOWS • ZIPPER-LESS ENTRY • INCLUDES BACKPACK, STAKES, AND TIE DOWN ROPES • HOLDS 3 HUNTERS COMFORTABLY • IDEAL FOR BOTH BOW AND GUN HUNTING • REALTREE EDGE CAMO PATTERN • Dimensions 75” x 75” Hub to Hub • Center Height Approx. 66” • Floor Space 58” x 58” • Weight Approx. 18.6 lbs. .. The Viper is the flagship blind in the four-blind series from Summit. The Viper 3-person blind combines numerous proprietary technologies designed to give you every advantage when hunting from the ground. Its Hush Silent Hatch hinged doorway system enables stealthy entry/exit without using a zipper. The windows feature TruView panels, which perfectly match the blind’s camouflage exterior, but allow for an unobstructed, near-360-degree view from the inside. The panels silently adjust up and down ..
Great for firearm hunting where you can set up a pop-up easily. Good for day hunts, or testing out a new spot. Window tie-downs Shoot-Through Mesh Stakes & High Wind Tie-Downs Backpack carrying case Pack dimensions: 24” dia. x 2” thick 60" Shooting width x 66" Tall Weighs approx. 14 lbs. .. 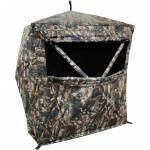 The 3-Person Ground Blind is the perfect hub style pop-up to fit in that perfect spot in the brush. Large enough for 3 people, and it will give you maximum concealment. 2 large panoramic windows and 2 sightline windows Silent Slider Window System with split window panels Loft Pockets above windows to hold Ozone generator (not included) Brushed fabric shell offers silence in the woods Large tie-down loops Water Resistant Blackout Interior Brush Holders Includes carry bag, st.. The Executioner 2-Person Ground Blind is the perfect hub style pop-up to fit in that perfect compact spot in the brush. Large enough for 2 people the Executioner will give you maximum concealment. 2 large panoramic windows and 2 sightline windows Silent Slider Window System with split window panels Loft Pockets above windows to hold Ozone generator (not included) Brushed fabric shell offers silence in the woods Large tie-down loops Water Resistant Blackout Interior Brush Hold.. 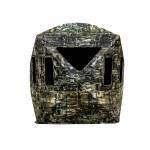 The revolutionary PrimosⓇ Double BullⓇ SurroundView™ 180° Blind is the Blind Without A Blind Spot™. It’s constructed with exclusive one-way see-through walls that let you see all of your surroundings without being seen. Now you can spot all the movement you miss with traditional blinds, yet remain just as concealed. The SurroundView 180° comes with two one-way see through walls and two rear blackout walls, loaded with Double Bull features like: Dimensions: 48 in x 48 in x 65 in Weight: 1.. The revolutionary PrimosⓇ Double BullⓇ SurroundView™ 360° Blind is the Blind Without A Blind Spot™. It’s constructed with exclusive one-way see-through walls that let you see all of your surroundings without being seen. Now you can spot all the movement you miss with traditional blinds, yet remain just as concealed. The SurroundView 360° comes with four one-way see through walls with one movable black out wall to place on any wall you choose, loaded with features like: Dimensions: 60 in x ..
Go with quality, go with Browning. Brushed polyester fabric reduces sheen and noise. Aluminum hubs with steel tips for durability. Window flaps can be adjusted to multiple positions. Extra fabric on corners for reinforcement. Includes a bow hanger. Carry bag has shoulder straps and compression straps for carrying extra gear like a chair. SILENT-TRAC Window System for Limitless Window Positions 180° Curtain Style Viewing Area 180° Strategic Window Placement with "Shoot-Thru" Mesh ..
Sets up in Seconds! Completely Blacked-Out Interior Silent, One-Hand Release Hooks for Window Adjustment 9 Steel Stakes with Interior Stake Pocket 2 Interior Gear Pockets Standard Carry Bag Included Product Specs CONSTRUCTION: Black Backed, Water Resistant Fabric in Epic Camo DIMENSIONS: 72” Shooting Width x 64” Standing Height HEIGHT TO BOTTOM OF WINDOWS: Corner Windows – 23”Center Windows – 34” CARRYING BAG: Standard Carry Bag with Backpack Straps .. 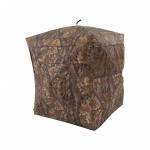 The Double Bull Deluxe ground blind has a zipperless door for silent entry even with gear on. 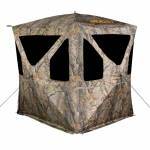 Equipped with the patented Double Bull hub system, this blind is easy to set up and extremely solid. 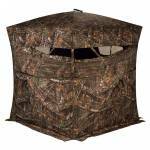 This blind has the same 180 degree front window that hunters have grown to love. Hub to Hub: 77” Height: 70” Floor Space: 60” X 60” Weight: 27 lbs. with bag Zipperless DOUBLE WIDE DOOR for silent entry and exit 180 degree Full Front View with Silent Slide window closures Legendary Doubl.. 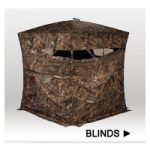 The revolutionary Primos Double Bull SurroundView 270° Blind is the Blind Without A Blind Spot. It’s constructed with exclusive one-way see-through walls that let you see all of your surroundings without being seen. Now you can spot all the movement you miss with traditional blinds, yet remain just as concealed. The SurroundView 270° comes with three one-way see through walls and one rear blackout wall, loaded with Double Bull features like: Dimensions: 55 in x 55 in x 70 in Weight: 21 l..